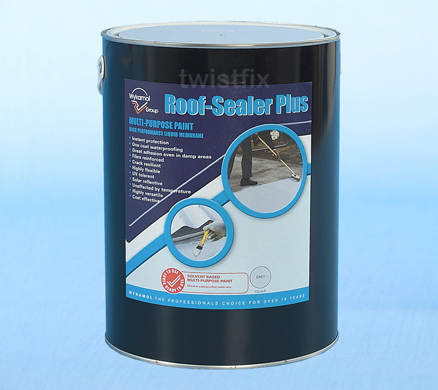 As we have recently received a number of calls regarding water ingress through roofs, Twistfix have introduced a special reduced-price offer on our fantastic Roof Sealing Paint. The roof of a property is the first line of defence against rain and must therefore be fully waterproofed to ensure that no ponding water is allowed to enter at all. Twistfix Roof Sealing Paint is a highly-innovative roof sealant that, when applied, produces a strong, durable coating with remarkable water-resisting properties. One of the most useful features of the paint is that it works instantly upon application, forming a tight waterproof seal on almost any roofing material. As the high-performance paint has this instan­ta­ne­ously-water­pro­ofing quality, it can be used even in the rain with confidence that it will provide immediate protection and will not wash away while it is curing. Applied with either a brush or spatula, the solar-reflective grey roof sealer paint generally covers with just a single coat and without the need for a primer, making Twistfix Roof Sealing Paint efficient, quick and simple to use. Utilising an elastomeric roof-sealing coating, this versatile product is suitable for sealing roofs made from or covered with damp concrete, slates, asphalt, metal, felt or asbestos. It is also ideal for use on roof lights, lead bays, flat roofs, gutters and valleys, providing lasting protection from exposure to the elements. The paint has added fibres which enhance the flexural strength of the roof sealer, allowing it to bend and flex with any roof movement naturally caused by heat. We believe that Twistfix Roof Sealing Paint is the best acrylic roof sealant on the market today and we invite you to try for yourself at the limited time reduced price. The paint is available in a tin of 5kg and guidelines state that 1-2kg should be used for coverage of one square metre, on average.